Giddyup! The Wild West is back! Annie Oakley, the most famous woman in the world, stars in her own Wild West Show, Madcap-style! Hilarious characters,tall tales and spine-tingling stunts bring American history to life like never before! 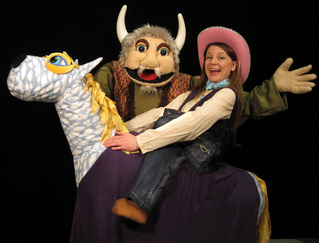 In this production, the only things taller than these tales are the giant puppets! Stories include: Johnny Appleseed, Paul Bunyan, Tailypo and Sally Ann Thunder Ann Whirlwind. This entry was posted in akron, Art News, arts, history, shows, theatre and tagged akron, arkon, art, art news, childrens, ohio, show. Bookmark the permalink.